Who Was Joseph Smith, and do Mormons Worship Him? | Mormonism: Really Want to Know? « Are Mormons the Most Homophobic People on Earth? Who Was Joseph Smith, and do Mormons Worship Him? “If you talk to God, you’re religious. If he talks back, you’re psychotic.”–Dr. Gregory House, House. The real sticking point for many people who take an interest in Mormonism lies close to the heart of who we are: The Joseph Smith story. For those of you who aren’t familiar with Joseph Smith, here are the quick essentials: Mormons believe that in 1820, a young farm boy in upstate New York was confused by the dissension among Christian churches. He decided to take the matter to the Lord in prayer in order to determine which church he should join. We believe that in answer to that prayer, God the Father and Jesus Christ appeared to Joseph Smith and instructed him to join none of the churches because none of them contained the fulness of the Gospel of Jesus Christ. Through a series of other revelations over a period of several years, Smith was directed to ancient records which were translated by the power of God and published as the Book of Mormon. In 1830, Smith formally organized the Church of Jesus Christ of Latter-day Saints. (That’s a ridiculously brief summary, but it should cover us for this discussion. A more complete account can be found at http://mormon.org/joseph-smith/). The idea of a 14 year-old boy receiving a direct revelation from God works fine as an Old Testament staff-and-sandal story, but bringing it to upstate New York in 1820 is just too much for some people. Granted, acceptance of Mormonism requires a belief in continuing revelation. It necessitates an acceptance that communication with our Father in Heaven is a two-way street. There is no getting past that, and Mormons wouldn’t want you to. Without continuing revelation, we’re just another Christian church, but with slower music. But some of the objections to Joseph Smith reflect a misunderstanding of why the LDS people believe there is a need for revelation, and misinformation about how we view Joseph Smith and his successors. Why would we need a prophet? 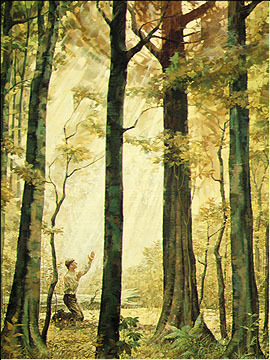 The first issue raised by the Joseph Smith story is why there would be a need for a prophet in 1820, 1920, or 2012. Traditional Christianity assumes that revelation ended with the ministry of Christ. The Bible, according to this view, contains all that we need to know of God, and it is pure conceit to add anything to it. This, in my view, leads to an obvious problem: Interpretations of the Bible have spawned an innumerable host of Christian churches that share only the most superficial similarities. Either God has no concern with consistency in doctrine or ordinances (a view proposed by much of the Christian world today), or something has gone wrong. Mormons believe that God established a pattern long ago for leading His children. He has always used divinely chosen (not self-chosen) leaders to whom He has communicated His will by revelation. He led Abraham by direct revelation, as He did Moses and all of the prophets of the Old Testament. In the New Testament, the coming of Christ was communicated by direct revelation to Mary and others, and after Christ’s resurrection the Church continued to be led by direct revelation to men like Peter, Paul and John ( the latter designated, in case the matter wasn’t clear enough, “The Revelator.”). Anyone who has more than a casual relationship with the Bible will recognize that the absence of a prophet always was bad news for the followers of God. Then all of that stopped. Why? There is no claim in the Bible that revelation had outlived its usefulness, or that God had suddenly decided that revelation was an outdated notion. Mormons believe that with the death of the apostles, there was no one with the authority to speak in the name of God. We believe that this was foretold clearly by the apostles themselves (something we will discuss in a later post). We believe that as a result of the loss of revelation, men were left to interpret the scriptures to themselves, and that they got some things right and some things wrong. We believe that God intended to introduce revelation again to the world to establish His pure doctrine, confirm the truths taught by Christ and His apostles, and provide guidance specific to our time and circumstances. We believe that process started with Joseph Smith. One of the problems faced by Mormons is that we frequently find ourselves trying to defend positions that we never have taken. Although we believe that the Church is led by a prophet, there are several things about such prophets that we do not believe. Most importantly, we do not believe that prophets are perfect. We claim, like the rest of Christianity, that only Christ was perfect, and I think LDS people are too sensitive when something negative is said about Joseph Smith, Brigham Young, or any of the other presidents of the Church. One doesn’t need to look any farther than the Doctrine and Covenants, which is a collection of revelations given to Joseph Smith and others, to find countless examples of the Lord chiding Joseph Smith, calling him to repentance, and even threatening to remove him from his position as President of the Church if he wasn’t obedient. Smith himself approved the publication of these revelations and therefore felt no hesitation in admitting human frailties. We should not try to place him on a pedestal that he never pretended to climb on himself. Prophets are men, fallible men, called to a holy responsibility. We believe that when they speak by the authority of God their direction is binding upon the Church. We do believe that these are good men worthy of emulation, but they are prophets, not gods. Critics of the Church apparently don’t understand that Mormons find the notion of worshipping Joseph Smith as repugnant as anyone else does. We hold him in great respect for the work he did, for his role as a recipient of revelation from God, and for his willingness to die as a martyr for what he believed. But the idea that we worship him is utter nonsense. It would make no more sense to say that Lutherans worship Martin Luther, that Catholics worship the Pope, or that evangelists worship Billy Graham. Granted, we make a remarkable claim that Joseph Smith actually received revelation from God. Not everyone can accept such a proposition. But respect for a prophet and worship of a God are two very different things. Mormons merely believe that the pattern God established with Adam and continued through the New Testament continues today, and that God has not forgotten His children even in a modern world that so often has forgotten Him. Really appreciate these excellent posts, which clarify the beliefs of the Church of Jesus Christ of Latter-day Saints. What the world needs now is more understanding, and less misinformation which drives misunderstanding. Thank you. Great job. Keep ’em coming. My Dad grew up in a weird family. This is not the practice of most Mormons but my father and his family actually worship Joseph Smith and place him higher than any other prophet and sometimes higher than Christ himself. I think he is weird and deceived. Yeah, that’s a little different. Different enough to get a person an invitation to go find another church. But it demonstrates the unfortunate fact that not everyone in the Church is aligned with even its most basic teachings. I’ve never encountered anyone that engages in worship of Joseph Smith, but I suppose if I stay alive long enough, I’ll run into all kinds of things. The problem with that, Ben, is that there was no Bible when Revelation was written. Whatever “these things” referred to, it wasn’t the King James Version of the Bible. Besides, it says the same thing in Deuteronomy, and if we took that literally then we would have to reject Christianity altogether. (John himself, by the way, wrote his Gospel after Revelation, so he certainly didn’t accept that Revelation was the last thing that would ever be written about Christ). Gee, maybe Joseph would have had an easier life if the saints had worshipped him; at least they wouldn’t have cheated him at his store, and he could have kept it open! Still, he WAS constantly having to tell members that he was no more than a flawed man trying to repent. People would get so upset that he played on the lawn with children, something that (they felt) NO prophet would ever do.